Enhance the ambiance of your business by using stunning live and artificial plant displays for your reception or premises. We understand that your business is an investment and we want our customers to know that we are there for them to help them accomplish any vision that they may have. 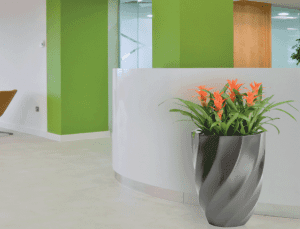 From new offices or refurbishing existing ones, our professional help and plant display services can help you. DO YOU LIKE THE IDEA OF HAVING SOME PLANTS IN YOUR WORK SPACE ? Birmingham, Coventry & Staffordshire Interior office plant displays across the Midlands and Anglia areas including: Birmingham, Staffs, Coventry, Staffordshire and Uttoxeter. Interior landscaping also in Newcastle under-Lyme, Stoke-on-Trent, Cannock, Burntwood, Lichfield, Tamworth, Solihull, Redditch, Droitwich, Bromsgrove and Oldbury. Plant displays for Dudley, Stourport, Wolverhampton, Walsall, Kidderminster, Bedworth, Warwick, Royal Leamington Spa and Kenilworth. All are indoor plants carry the option of HIRE, PURCHASE or RENTAL. Interior plant displays & office plants across the Midlands and Anglia areas including: Cambridge, Cambridgeshire, Peterborough and Huntingdon. Plant displays also in St Ives, St Neots, Whittlesey, Chatteris, March, Corby, Nuneaton and in Lincoln. Office plants for interiors in Lincolnshire, Bourne, Spalding, Market Deeping, Stafford and Stamford. All our indoor plant displays carry the option of HIRE, PURCHASE or RENTAL. Interior office plant displays across the Midlands and Anglia areas including: Stamford, Rutland, Oakham, Shepshed, Coalville and W hitwick. Plant displays in Hinckley, Lutterworth, Atherstone, oadby and Uppingham. Office plants in Market Harborough, Corby, Kettering and Rugby. All are Indoor plant displays carry the option of HIRE, PURCHASE or RENTAL. Interior office plant displays across Bristol, Bath, Swindon, Cheltenham, Gloucester, Worcester, Hereford, Malvern, Cardiff, Western Supermare, Devizes, Taunton, Eversham. All are Indoor plant displays carry the option of HIRE, PURCHASE or RENTAL. Interior office plant dispalys across the Midlands and Anglia areas including: Derby, Derbyshire, Swadlincote, Melbourne and Burton on Trent. Barton under Needwood, Long Eaton, Kilburn, Heanor and Ashbourne. Plant displays also in Belper, Codnor, Ilkeston, Stapleford and Tutbury. All our Indoor plant displays carry the option of HIRE, PURCHASE or RENTAL. Interior office plant displays & office plants in all areas across the Midlands and Anglia areas including: Nottingham, Nottinghamshire, Mansfield, Ripley, Grantham, Sleaford, Lincoln, Radcliffe on Trent and Newark on trent. Melton Mowbray. plant displays in Loughborough, Ashby-de-la-Zouch, Office plants in Kegworth, Kirkby in Ashfield, Worksop, Ilkeston, Beeston, West Bridgford, Keyworth, Cotgrave, Bingham, Bottesford, Eastwood, Hucknall, Sutton in Ashfield and Long Eaton. All our indoor plant displays carry the option of HIRE, PURCHASE or RENTAL. East, West Midlands & Central England. All office plant displays & Interior landscaping available in the East and West Midlands and Anglia areas:Cambridgeshire, Nottinghamshire, Lincolnshire, Leicestershire, Bedfordshire, Northamptonshire, Derbyshire, Staffordshire, Warwickshire, Rutland, Birmingham, Leicester, Nottingham, Derby, Peterborough, Cambridge. Office plants in Milton Keynes, Coventry, Northampton, Bedford, Huntingdon, Burton upon Trent, Stoke on Trent etc.. All are indoor plants carry the option of HIRE, PURCHASE or RENTAL. All office plant displays & Interior landscaping available in inner London, outer London, Slough, Reading, Windsor, Bracknell, Chelmsford, Colchester, Oxford, Buckingham, Swindon. All are indoor plants carry the option of HIRE, PURCHASE or RENTAL. if your loction is not on the map, it doesn't mean we cant work with you.